If a used car has had its mileage "treated," dissatisfied customers can use this complaint letter to return it. I am writing to let you know that the mileage on a car I purchased off your lot on Jan. 3, 2010, was grossly misrepresented. I paid $25,000 ($5,000 down, $20,000 financed) for a vehicle (VIN number and other paperwork is enclosed) that your salesman assured me had been driven only 2000 miles. However, when I took it to my mechanic he discovered that the odometer had been "rolled back" and the true mileage was closer to 20,000. 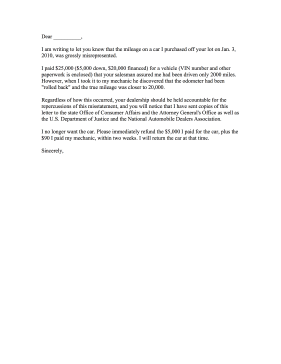 Regardless of how this occurred, your dealership should be held accountable for the repercussions of this misstatement, and you will notice that I have sent copies of this letter to the state Office of Consumer Affairs and the Attorney General's Office as well as the U.S. Department of Justice and the National Automobile Dealers Association. I no longer want the car. Please immediately refund the $5,000 I paid for the car, plus the $90 I paid my mechanic, within two weeks. I will return the car at that time.